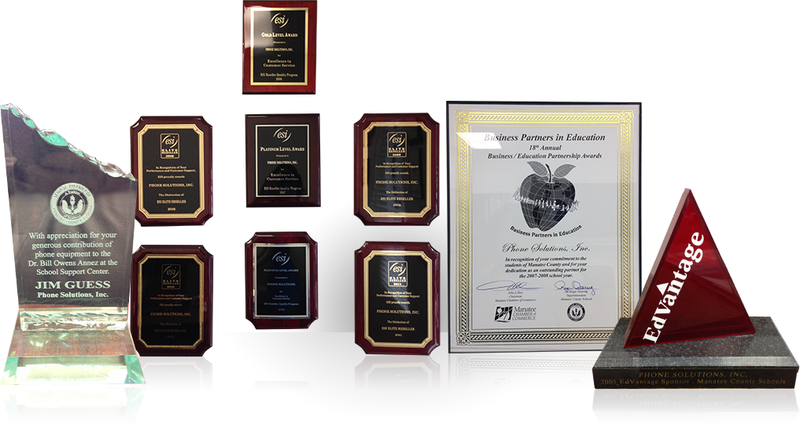 Phone Solutions is proud to service and maintain over 6000 ESI telephones for the School District of Manatee County. Over the last 10 years Phone Solutions has installed and programmed 65 ESI 600 communication servers for the District. In addition we have designed and implemented a district wide fiber network connection to all of the ESI 600 switches for seamless desk to desk calling and voice mail forwarding. Phone Solutions has also sold and installed over 200 ESI systems for large corporate accounts as well as small to medium sized businesses. Phone Solutions and the knowledgeable techs have always exceeded our expectations with their industry knowledge and prompt service. I always know if I have a phone system or carrier question or problem they can either give me an honest answer to it or guide me to the right place. Thanks for everything!